HONG KONG – GRE Alpha, a leading LED power supply manufacturer, introduces its groundbreaking ENO-DIM dimming module. The module integrates GRE Alpha’s proven smart dimming technology with EnOcean’s innovative energy harvesting technology. The module is compatible with any EnOcean-enabled wireless switch and operates at a high-reliability proprietary frequency band, thus allowing for interference-free near-instantaneous feedback. The ENO-DIM is available in three regional power supply versions: 902MHz in North America, 928 MHz in Japan, and 868MHz in Europe and China. The single-channel ENO-DIM module hooks up in minutes to any constant voltage LED driver, including an existing DC power distribution panel or at any point in an existing lighting circuit. The ENO-DIM module operates at a maximum 5 Amp capacity and can support up to 30 EnOcean wireless energy-harvesting devices. The module adheres to UL8750 standards and is IP20-rated. This dimming module makes it possible to easily retrofit existing wired lighting control systems with simple to install wireless switches. These switches utilize the energy created by the touch of a button to send a wireless signal to the ENO-DIM module. There are no batteries or wires required, and switches can be mounted anywhere. ENO-DIM applications include architectural lighting, effect and contour lighting, general commercial illumination, warehouses, signage, strip lighting and more. The ENO-DIM dimming module is one of the most innovative products in the industry. By combining GRE Alpha’s dimming technology with EnOcean's self-powered sensors and switches, GRE Alpha is paving the way for industrial lighting systems that are sustainable and energy-efficient. Industrial lighting control systems generally aim to maximize energy savings, satisfy building codes, or comply with green building and energy conservation programs. These Smart Lighting systems are fast becoming a staple in modern commercial architectural design. Today’s lighting components must be able to “talk” to one another, meaning they must use the same communication protocols to trigger specific actions, such as synchronizing and dimming light fixtures. Popular wireless protocols include Infrared, Bluetooth, Wi-Fi, Zigbee, Thread, Z-Wave and KNX. The number of wireless networking options is increasing. With so many connection protocols available, it is essential for smart system designers and specifiers to understand the fundamental similarities and differences among various wireless protocol brands. This article identifies standard features as well as dissimilarities among three popular wireless protocols – Bluetooth®,Wi-Fi® and Zigbee– and outlines best industrial lighting applications for each technology. Short for Wireless Fidelity, Wi-Fi® networking is a growing trend in smart building design. Wi-Fi® first gained popularity for media streaming gaming, browsing the web and other data-heavy activities because of its high bandwidth capability. Wi-Fi® uses radio frequency to transmit data through the air. The communication protocol is stable and cost-effective, yet traditionally many designers avoided the technology in industrial applications because of its high power requirements. Recent improvements to Wi-Fi® power efficiency has prompted many designers to reconsider the technology for industrial lighting applications. Because of the limitations on the number of network-connected devices, the technology is more suitable for small commercial lighting applications. Zigbee is an open wireless communication protocol based on the IEEE 802.15.4 technical standard. This openness leads to greater competition and innovation among developers. Its maximum speed of 250 kbps at 2.4 GHz makes it slower than other popular wireless standards. However, ZigBee shines in comparison to the other wireless protocols in power consumption efficiency. Zigbee was designed to transmit small packets of data at relatively infrequent intervals, making it easy to connect battery-operated devices such as LED lighting. The Zigbee protocol supports star, tree and mesh networking topologies. Mesh-networked devices use each other to transmit signals; often referred to as many-to-many (m:m) communication. Single device malfunctions do not interrupt the network. Mesh networking topology strengthens connectivity and increases network scalability, opening the pathway for designers to incorporate the technology in increasingly sophisticated industrial lighting applications. The newest version, Zigbee 3.0, further standardized the protocol, allowing for seamless compatibility among all Zigbee-certified devices regardless of branding. Zigbee aims to be the global standard for all “Internet of Things” (IoT) solutions. According to the Zigbee Alliance, the IoT market is expected to grow from $180 million in 2014 to more than $1 trillion by the year 2020. It is no surprise, therefore that manufacturers, like GRE Alpha® Electronics, are jumping at the chance to get in on this technology. The company specializes in the design of solid-state lighting power supplies and lighting control accessories and is a trailblazer in the design of Zigbee-certified devices. Its SLD-SMARTDIM wireless dimming module, for example, is Zigbee-enabled and compatible with a wide variety of smart switches and controls. The module delivers flicker-free 0-100% dimming and a fast response time for easy control of constant voltage LED fixtures. Released in 2000 and originally designed to replace serial cables and support wireless audio applications, Bluetooth is arguably the most widely recognized wireless connectivity brand. The newest version, Bluetooth Low Energy (LE), uses very little power compared to the original variety. The addition of mesh networking support in the summer of 2017, opened the floodgates to sophisticated industrial lighting applications. Often referred to as Smart Bluetooth, the mesh-based LE technology is not prone to signal loss like the Wi-Fi protocol. Like Zigbee, the technology supports complex many-to-many device communication, and networks can be designed to cover large physical areas. The technology is also interoperable across products from different vendors and is secure, scalable and upgradeable, making it a key player in the IoT market and especially suitable for large-scale industrial lighting automation applications. GRE Alpha recently partnered with the EnOcean Alliance to further develop its wireless offerings to Bluetooth® LE-enabled devices and other wireless applications. Continued advances in these wireless technologies are ushering building design into an era of all-in-one facility automation, increased energy savings, greener construction practices and straightforward code compliance. Digital addressable lighting interface, or DALI, is a global standard that enables ballasts, controllers, switches and sensors to communicate with other DALI-compliant devices. DALI was initiated in the late 90’s, but has since undergone drastic changes that expand its scope and improve its effectiveness. Failing to recognize and comply with DALI 2 can impact your brand in a big way: you could lose your official DALI seal of approval. While your product could still function properly, lacking this seal can hurt your brand’s reputation and dissuade sellers. This makes knowing the difference between DALI and DALI 2 essential to your brand. An additional change brought on by DALI 2 is the increased scaling of DALI applications, such as the standards of automated building. Thus far this has resulted in better interoperability between DALI compliant devices, and increased the number of backwards compatible devices. This brings with it several major benefits. Beyond the clear benefit of better interoperability, the invention of the DALI standard has resulted in numerous benefits to the LED and lighting world. DALI standards have led to DALI dimmers, such as the SLD-DIM DALI and GLD DIM modules from GRE Alpha. These modules enable both new and old LED fixtures to become dimmable, without the added fuss of complicated wiring and circuitry this functionality would have required in the past. Before DALI, ballasts were capable of one-way transmitting of information only. With DALI compliant ballasts, information can be sent to and from the ballast to the fixture. This enables the collection of error logs, custom programming of ballasts, and allows dimming based on brightness perception. Combined with the ballasts’ ability to limit the energy consumption only to what is needed, this means more precise and efficient lighting. The rise of DALI has led to more LED manufacturers creating DALI-compliant accessories. This makes finding the perfect lighting solution easier for designers, as the DALI seal of approval ensures the part will work properly with their existing DALI-compliant devices. For example, architectural LED power supplies allow lighting to perform in collaboration with the structural design. This is made possible because DALI ensures DALI-compliant devices will work together. Note: DALI compatible devices are not the same as DALI compliant. DALI compatible devices were built with the DALI standards in mind, but were not put through the same testing as DALI compliant devices. DALI compatible may work with DALI compliant devices, but their compatibility is not guaranteed. Look for the DALI seal to be on the safe side. DALI-compliant devices may come at a higher cost than non-DALI-compliant devices. However, DALI devices often require less wiring than non-DALI-compliant devices, making them both cost efficient and easier to install. When looking at the price of DALI devices, keep this in mind. The rise of DALI-compliant products, especially ballasts, has led to a bigger focus on products that perform better. With ballasts becoming more efficient and ensuring only the necessary power is drawn to power a fixture, LED power supply manufacturers have shifted their focus to making more efficient power supplies. There is no need to sacrifice quality for efficiency. Devices that are up to 97 percent efficient and reduce the end users exposure to flicker. Despite the development of newer wireless control technologies such as Zigbee and Bluetooth LE the DALI protocol’s overhauled makes it relevant for years to come. In fact, the standard has been restructured and now shows improvements in speed reliability. Combined with modern LEDs, the standard has led to more efficient and adaptable lighting, yet a lack of understanding has led to many companies not moving forward with DALI-compliant devices. Become acquainted with the benefits of DALI, and then contact GRE Alpha for more information on our easy-to-install DALI-compliant dimming modules. HONG KONG - Premier lighting industry experts from around the world, including representatives from GRE Alpha's three regional service centers gathered for the 19th Hong Kong International Lighting Fair (Autumn Edition). The event, organized by the Hong Kong Trade Development Council (HKTDC), drew more than 650 brands and upward of 2,700 companies with the purpose of highlighting the best products and emerging trends in the industry. In a post event survey conducted by the HKTDC, respondents considered household lighting (29 percent) to have the greatest growth potential in 2018, followed by LED and green lighting products (24 percent) and commercial lighting (16 percent). These growth areas are impacted by the internet of things (IoT) or internet-connected objects. IoT is more than a buzz word, it is changing the lighting industry in very big ways. "It's not just about lighting anymore, it's about how lighting can be connected with everything else such as your smartphone, your car or even your TV," says Richard Fong, Director at GRE Alpha. After nearly a decade in the smart dimming and lighting accessory industry and sixth year at the fair, GRE Alpha has seen technological shifts up close. They were the honored have products featured on the cover of the official HKTDC lighting fair magazine. Inside the publication, Fong shares his thoughts the demand for smart lighting is driving the development of IoT dimming solutions and the adoption of Digital Addressable Lighting Interface (DALI) protocols. Fair attendees were able to see GRE Alpha's state of the art XLD series and DALI dimming modules. The XLD series dimming modules are suitable for consumer-grade LED applications and are engineered to fit inside any existing lighting fixture. When combined with a variable resistor or potentiometer the XLD dimming modules can result in flicker-free dimming. With the support of up to 28VDC x 1000mA, or 28 watts of input power, and easy installation, the XLD series dimming modules are an ideal choice for commercial needs of any scale. The DALI dimming module, the other major product showcased by GRE Alpha, is an intelligent dimmer for home and commercial automation. The DALI dimming module supports a wide range of DC inputs - from 8-48 volts - and features spring-loaded terminals for easy installation. This dimming module offers 0-100% linear dimming with a standby power usage of fewer than 0.1 watts. Meeting the standards of the latest DALI Lighting control protocol IEC 60929, the DALI dimming module from GRE Alpha is an energy-efficient way to ensure lights are dimmable and effective. Like all of GRE Alpha's products, the DALI and XLD series dimming modules were designed with the modular approach in mind. This allows them to be used with new or existing lighting fixtures, lowering the price barrier for many businesses with older fixtures. "GRE Alpha's unique modular systems approach enables our customers to quickly adapt to IoT (Internet of Things) and connected lighting allowing quick, easy and seamless upgrades of passive lighting systems into SMART lighting systems." 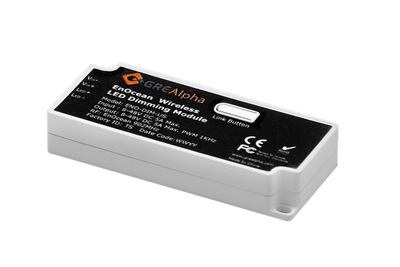 HONG KONG - GRE Alpha Electronics, Ltd., an LED power supply manufacturer has joined the EnOcean Alliance, known for self-powered wireless sensor solutions for battery-free applications in the internet of Things (IoT). EnOcean's seamless integration of self-powered sensors and switches, featuring GRE's smart dimming lighting technology function with building management systems. The powerful combination aims to speed the adoption of sustainable building and home automation systems. IoT connected devices require masses of data to improve daily lives. Sensors gather this data by monitoring temperature, motion, presence, light conditions and much more. EnOcean is the backbone for such a comprehensive network of self-powered wireless sensors that provide reliable sensor data for IoT systems. GRE products pair well with EnOcean's patented energy harvesting wireless technology. "GRE Alpha's EnOcean-certified products will be the first of many innovative IoT lighting control products to enable this vision," says Richard Fong, Director at GRE Alpha. Current plans include launching three regional power supply versions: 902MHz in North America, 928 MHz in Japan, and 868MHz in Europe and China. GRE offers a host of products such dimmers, surge limiters and AC/DC LED drivers. While their products vary in function, they all have one thing in common - they're modular. With GRE Alpha's modular approach to LED technology and EnOcean Alliance's wireless innovations, trillions of IoT sensors can be powered and efficiently deployed. EnOcean's end-goal is to enable interoperability between original equipment manufacturer and partner products. "Our partnership with EnOcean will allow for quicker innovation and rapid adoption of IoT in the smart lighting space via EnOcean's wireless platform," Fong says. As a member of the EnOcean Alliance, GRE Alpha will have access to exclusive software and peer work groups, allowing them to share their LED expertise and collaborate with other EnOcean Alliance members to design the technologies of tomorrow. Leading companies worldwide from the building sector formed the EnOcean Alliance to establish innovative maintenance-free wireless solutions for the internet of Things, which are used for automation solutions for sustainable building projects - making buildings more energy-efficient, more flexible and more cost effective. The core technology of the Alliance is energy harvesting wireless technology for flexibly positioned and service-free sensor solutions. The EnOcean Alliance aims to internationalize the energy harvesting wireless technology and is dedicated to creating interoperability between the products of original equipment manufacturer partners. The basis for this is the international standard ISO/IEC 14543-3-1X, which is optimized for wireless solutions with ultra-low power consumption and energy harvesting. More than 400 companies currently belong to the EnOcean Alliance. The headquarters of the nonprofit organization is located in San Ramon, California.